I don’t like drama, unless it’s on my plate. A visual wow with a delectable finish makes for a memorable meal. Coddled eggs with bacon and parmesan do just that. A grand entrance, even on Ordinary Tuesday, requires suprisingly little effort. The term coddled means pampered, handled with care. Eggs are cooked slowly in porcelain vessels called coddlers. These pretty little cups from Britain have been around since the late 19th Century and are quickly becoming popular here in the States. But, if you haven’t got any, don’t worry – neither do I. I cook mine right in their own shells. The eggs take a dip in water that is heated very gently under boiling point, long enough for a firm outer white, but gooey yellow yolk. Tradition dictates that bacon and eggs are strictly breakfast food, but you can eat these coddled eggs any time of day, even dinner. Breaking the rules is so delicious. Note: Make it vegetarian with some gorgeous maple-glazed coconut bacon. Fry bacon til crisp. Remove from heat and dab oil with paper towels. Set aside. Fill a pot with water and add a pinch of baking soda. The baking soda helps prevent the shell from cracking. Put the lid on and set over a medium flame. You don’t want to get heat the water quickly, just so that it is boiling very gently. At this point, use a spoon to submerge the eggs into their warm bath. Let them stay for just 4 mins. Any longer and the yolk will have solidified. Remove eggs from the hot water and set them onto a towel to dry. Bore a whole into a slice of fresh bread. Tap the top of the egg with a spoon and carefully remove the top 1/3 of the shell. Nestle the egg into the bread. Season with salt and paper. Crush crisp bacon and sprinkle on top. Add a pinch of sliced scallions, a dash of grated parmesan and serve warm. Do you remember that old TV commercial where the mom is sitting at the kitchen island, reading a trashy romance novel and munching on rice krispies treats? She slaps some flour on her face and takes the plate into the living room to make it look like she’d been slaving away in the kitchen. These eggs will make people think you have a degree from Le Cordon Bleu. Wait til tomorrow morning, if you can bear the temptation, and serve this as breakfast in bed. Inpatient souls will break tradition and serve it tonight. 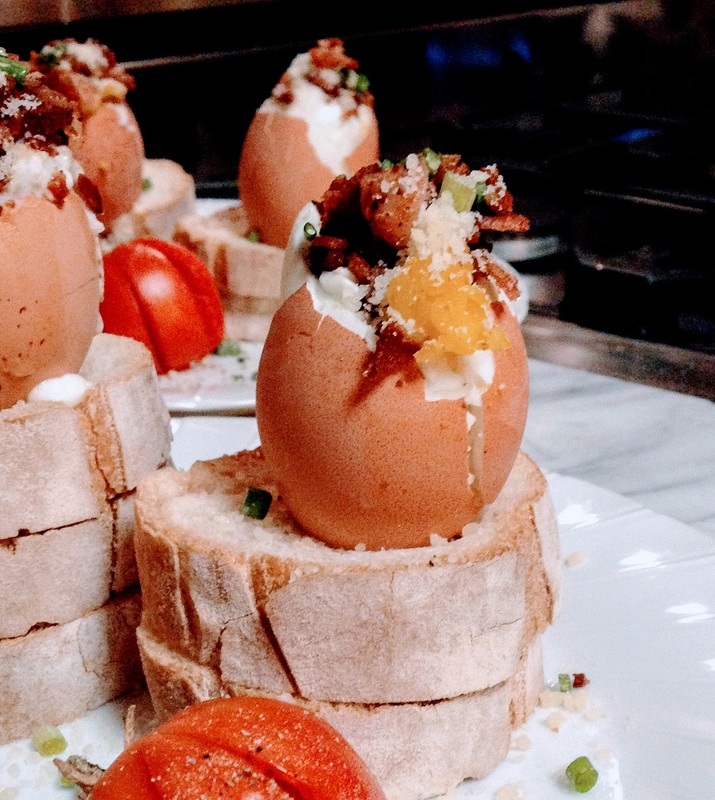 Coddled Eggs with Bacon and Parmesan give dinner elegant flare, but how easy they were to prepare will be our little secret.